After purchasing a domain, comes the dilema of finding a good place to host it. Same was the case with my domain http://mayankrajoria.com. Since this is my personal website, I decided it would essentially be a static one. 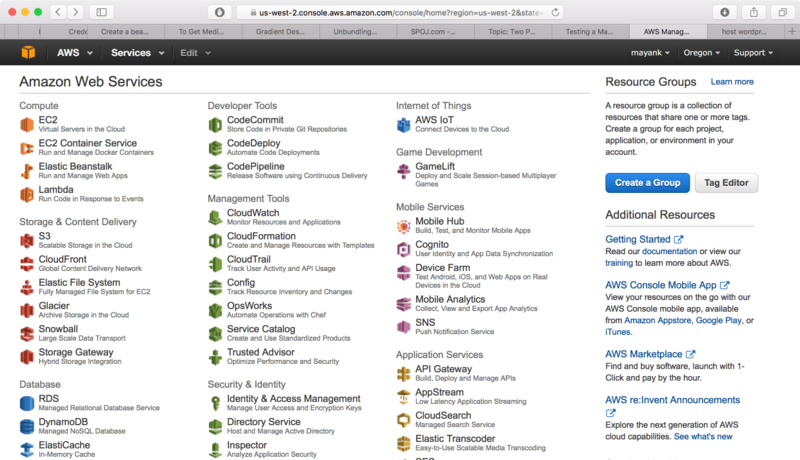 Now for such websites, AWS S3 is pretty much the cheapest and most reliable way of hosting. 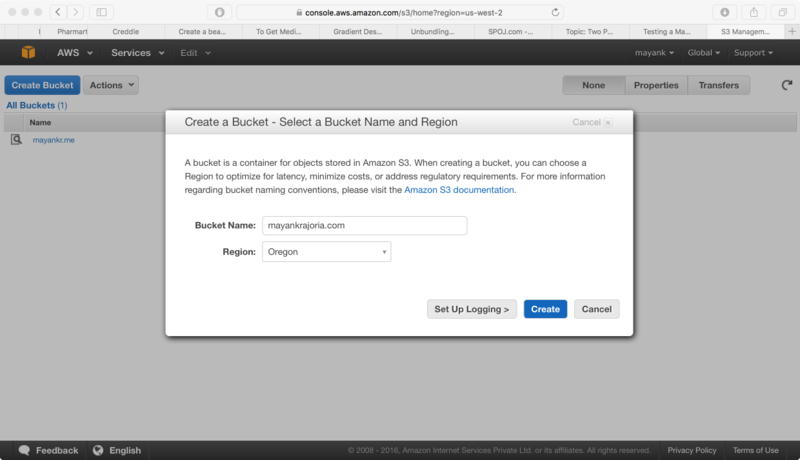 The S3 service provided by Amazon gives you “buckets”, into which you can store files. We make use of the fact that these files can then be served to the internet easily. 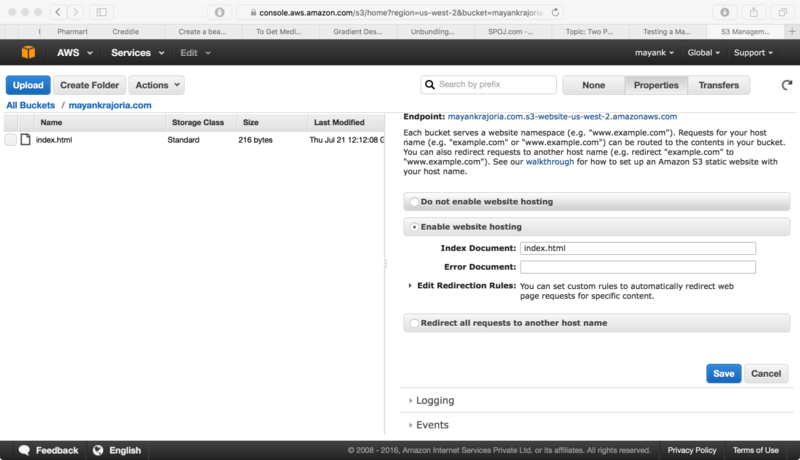 So here are the steps for getting you started with S3 hosting for your own static website. The steps: Get an AWS account :p. I can’t really help you much here because its a simple procedure and you only need a credit card. You also are elligible for the free teir for 1 year when you sign up. So essentially, you will be hostng your site for free for an year, ain’t that cool!! Also purchase a domain that you would like to host the website for. The domain mayankrajoria.com is purchased by me from GoDaddy. Now click on S3 and the following home for the S3 service should open up. Now we’ll have to create a bucket. 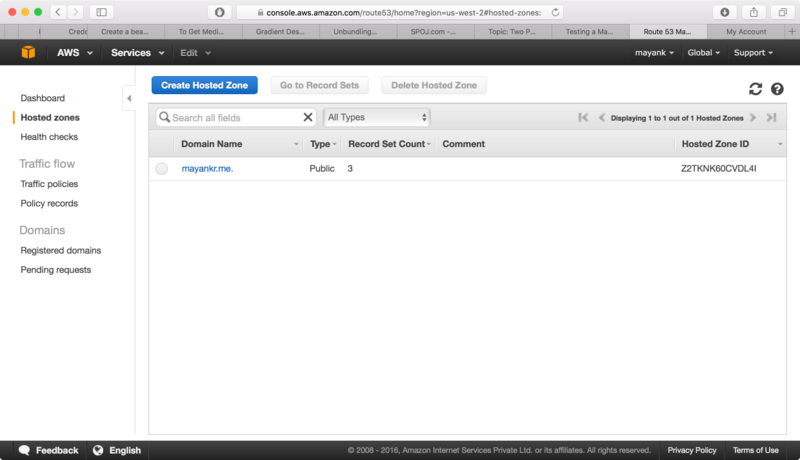 No, not the one you take a bath with, but a container used for storage in AWS S3. We shall be putting our website code into a bucket. As you see I already have a bucket for mayankr.me. Lets go ahead and create a bucket for my new site, mayankrajoria.com. Remember to use your domain name as the name of your bucket. Just select a region closest to your place. <meta name="description" content="Personal website of Mayank Rajoria. Simple enough for our first page, right? After uploading, the file index.html will appear at the root of your bucket. Click Properties on top right and click Enable website Hosting and enter index.html as Index Document. You don’t need to use an Error Document right now. See the below picture for reference, then click Save. 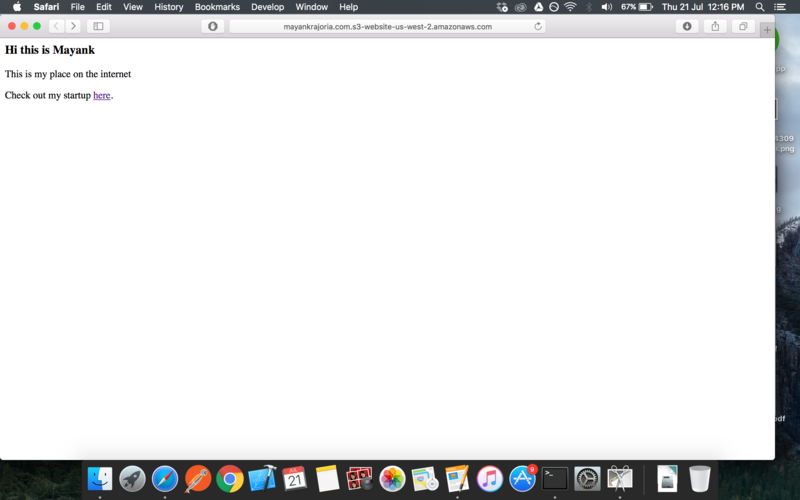 Make note of the Endpoint, this is the url at which your bucket will be public at initially. Next we need to edit the permissions of your bucket so that it serves your website to anyone accessing it over the internet. 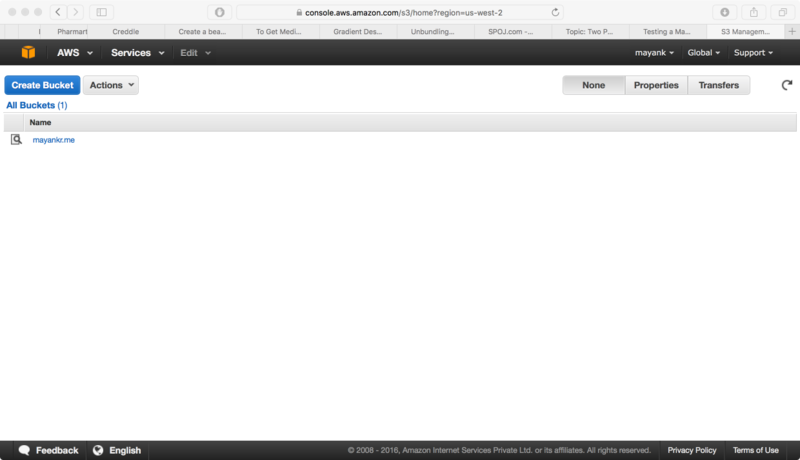 Just go to the S3 home page and select the bucket of your website. 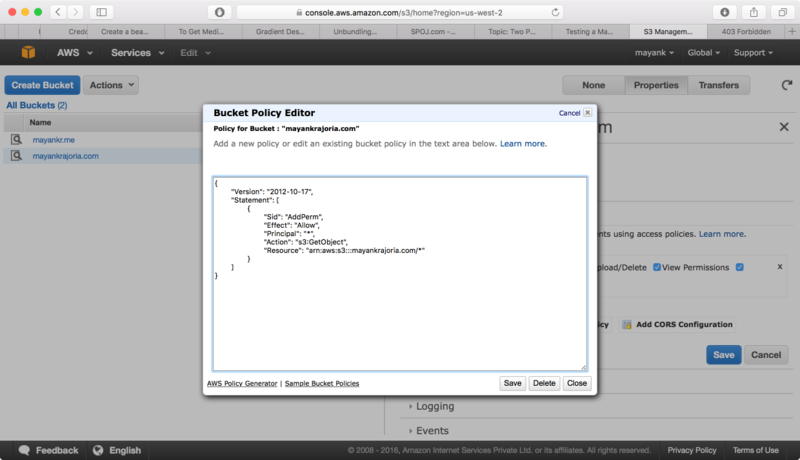 Go to Properties > Permissions > Add Bucket Policy and add the following text in the text box that comes up. Cool, now our bucket is public and accessible over the internet!! 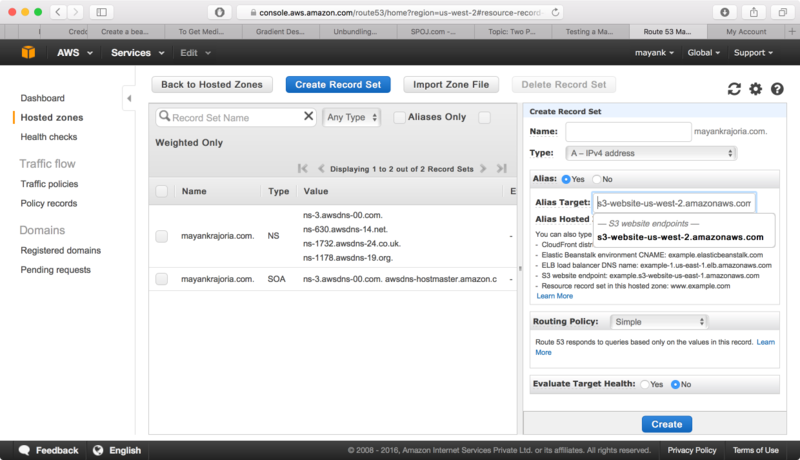 Go to the url we noted as Endpoint and you shall see the website, mightly hosted on AWS. 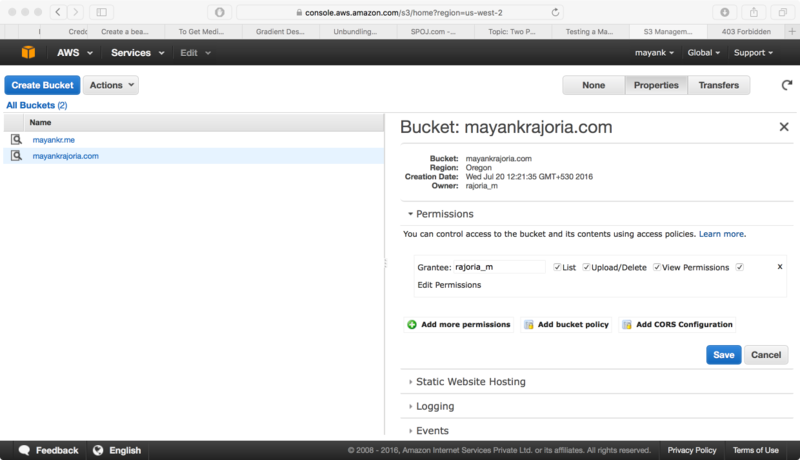 Now to redirect our url mayankrajoria.com to the bucket, we hop over to Route 53 in AWS. You can see, I already have a hosted zone created for mayankr.me. 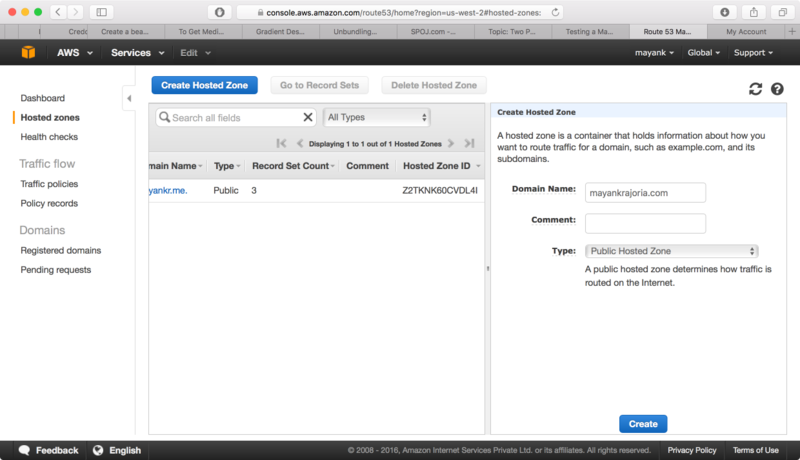 We’ll now create a new Hosted Zone by clicking on Create Hosted Zone. Enter your domain name on the left and click on Create. 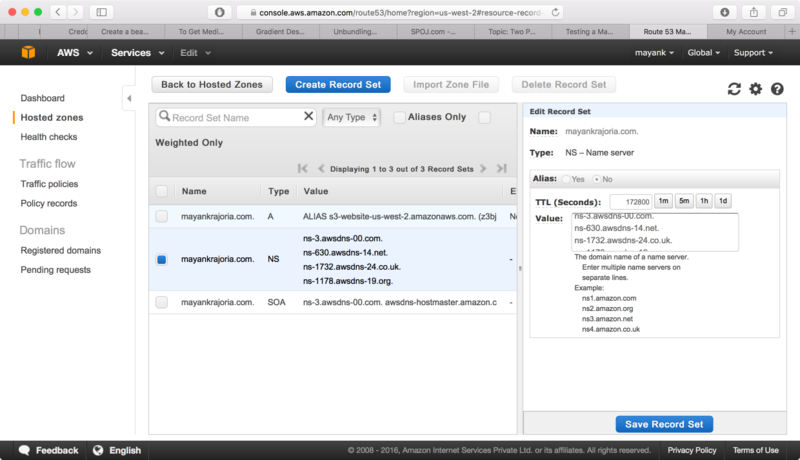 Open the newly created hosted zone and and create a Type A record. Under alias target, use the bucket you created for your website. Leave all rest as it is and click Create. 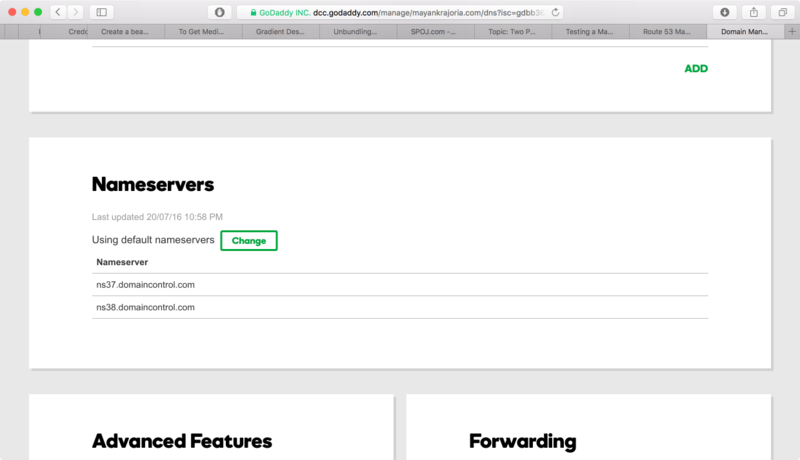 I had registered my domain using GoDaddy, so I’ll have to modify the domain properties in my GoDaddy account so that the AWS nameserver is used to serve my site. Make note of the 4 NS record URLs for your website. 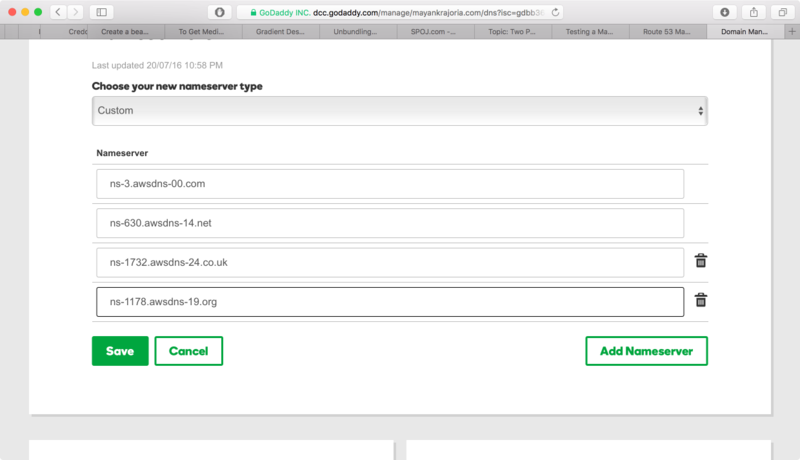 Now go over to GoDaddy or your domain provider and change the Nameservers for your domain to the new ones. I am Mayank Rajoria. Currently a grad student at UC San Diego pursuing Masters in CS. I majored in Computer Science and Engineering for my undergrad from IIT Delhi. I Cofounded & acted as CTO of Pharmart.